In 1991, Philadelphia's Old City Arts Association launched the First Fridays initiative to encourage visitors to explore the art galleries that made the historic neighborhood their home. A quarter-century later, the area has been completely transformed into one of the city's premier cultural hubs, and now there's yet another reason to head to the 'hood: the brand-new Philadelphia Design District (PDD). The new collective celebrates the independent design businesses—showrooms, workshops, galleries, and shops—in the area spanning from Second and Third Streets to Market and Race. The PDD will make its official debut this spring with a showcase curated by design studio Mona Rose Berman Interiors that will run from April 14 to 28 at the new LEED Gold–certified Bridge apartment building by Gluck+. The first of its kind in Philadelphia, a city with a rich history of manufacturing and design, the PDD unites 11 founding members, including Moderne Gallery, a city staple for art deco designs and the work of George Nakashima; Mode Modern, the city's go-to destination for midcentury modern designs; Wexler Gallery, which represents contemporary names like Gulla Jónsdóttir; the multidisciplinary art practice Biello Martin Studio; and more. More events will be scheduled in the future, but in the meantime, be sure to check out Philadelphia's newest design destination. Known as perhaps the most diverse collections of works by George Nakashima, the Roth Collection chronicles a relationship that one family forged over three decades with the artist. The George Nakashima Roth collection recalls the family's intimate visits with the artist to select furniture for their home—and now they are up for sale at the Freeman’s Design auction on October 8th. As the story goes, longtime couple Arnold "Archie" and Corinne "Cookie" Roth grew up primarily in New York in the 1920s and 1930s, met through mutual friends, married in 1950, and settled in Brooklyn. With humble beginnings, Corrine, the science teacher, taught in the New York public school system and Archie, an engineer, became the part-time owner of a small die cutting business. In 1966, they relocated to Livingston, New Jersey, where they remained through their lives. Fueled by a mutual devotion to modern design, the pair collected works that were indicative of their taste: wooden furniture that would be categorized by the auction houses as organic modernist. 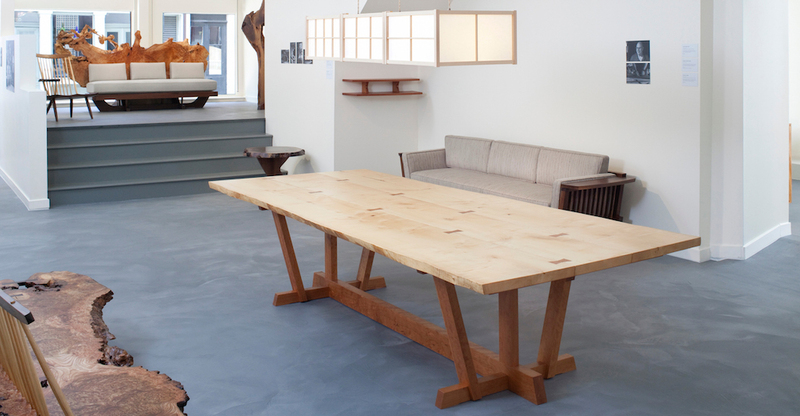 From the early turned-leg coffee table ordered in 1961 to the monolithic bench and cushion chairs from the Conoid series (dating to 1979 and 1980 respectively), Nakashima's work was handpicked by the Roths over the span of three decades. Each piece is a part of the story that unfolds, surveying Nakashima's evolving design sensibility and craftsmanship – the fusion and jutxaposition of two incongruous cultures, American vernacular and traditional Japanese craftsmanship. His marriage of natural materials and hand craftsmanship illustrates his vision of the construction of a chair: function, beauty, and simplicity. When you look at Nakashima’s creations, you can see the the influence of American arts and crafts furniture, specifically the Windsor chair and the “captain's chair.” The Windsor influence is most apparent in the Straight Back chair, the Mira chair, the Four-Legged chair, the New chair, and to a lesser extent, the Conoid chair (the armchairs are a streamlined form of what is commonly referred to as the captain's chair). The New and Conoid chairs remain aesthetically tied to the Windsor, juxtaposed with a contemporary-looking Japanese yoke back and crest rail. In this poetic gesture, the Conoid chair became a modern design icon inspired by the 1924 and 1927 cantilevered chairs designed by Heinz and Bodo Rasch. Eventually, this unexpected and expressive combination of Eastern, Western, and modern influences came to shape each chair and evolve into the distinctly idiosyncratic design that would characterize the work of George Nakashima. You can view the complete catalogue online here. 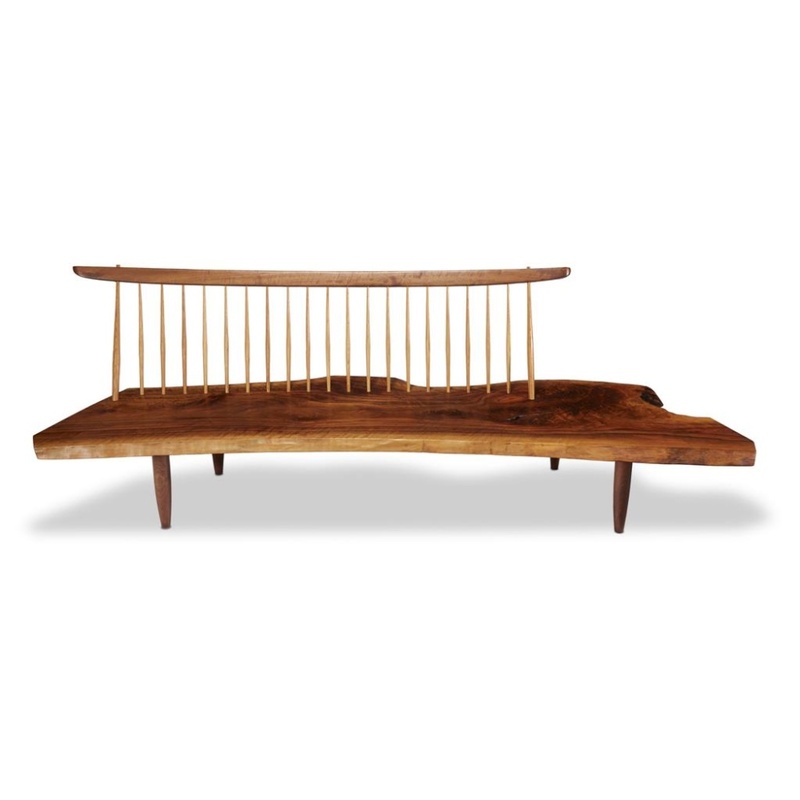 Freeman's: Design features works by George Nakashima, René Lalique, Eero Saarinen, Finn Juhl, and others. In advance of the auction, you can browse lots before live bidding begins on Sunday, October 8th at 12:00pm ET. Crafting Modernism: Midcentury American Art and Design Museum of Arts and Design 2 Columbus Circle Through January 15, 2012 Crafting Modernism: Midcentury American Art and Design presents the evolution of the design industry spanning 25 years, from the late 1940s to 1969. The show explores the contributions of artists and designers using craft media—defined here as clay, fiber, wood, metal, glass, and alternative materials—within a culture focused on mass-production in the years following World War II. Through their work, designers and craftsmen reacted to the plethora of machine- and mass-produced consumer appliances, furniture and textiles; at the same time a there was a growing consumer interest in the individualistic aesthetic of handmade works. 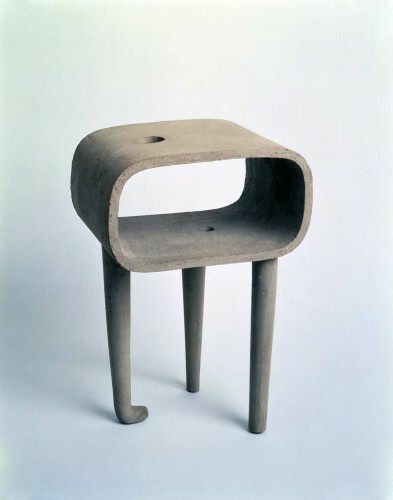 Craft, which spanned the fields of product design to architecture, became a medium for social commentary, philosophy and wit, as seen in the My Mu terracotta vase by Isamu Noguchi (above), an idiosyncratic, three-legged ceramic containing a central cavity that provocatively references the Zen concept of mu, meaning “nothingness.” In addition to Noguchi, the exhibition features the work of Harry Bertoia, George Nakashima, Ray and Charles Eames, and Alexander Calder, among others.